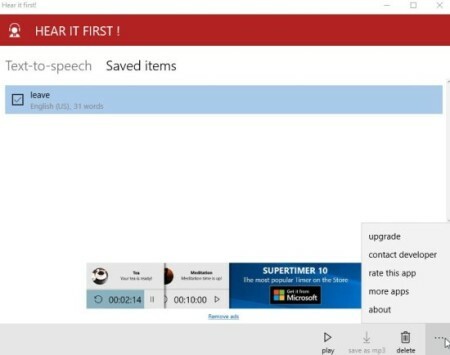 Hear it first is a free Windows 10 multilingual text to speech app. This app can prove to be helpful in learning the correct pronunciation of words. It can come handy if you are learning a new language and want to know the correct pronunciation of words. You can even use it when traveling to another country where the native language is different. 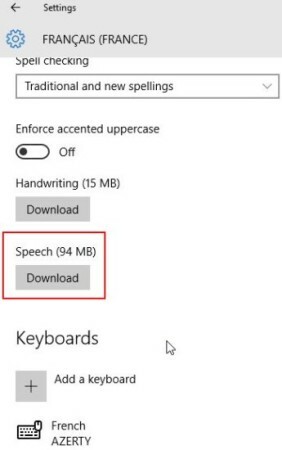 This multilingual text to speech app can be downloaded from the Windows 10 store. When you launch the app for the first time, you will see the interface as shown in the below screenshot. As can be seen in the above screenshot, the default text to speech language set is English. The box given below is for you to paste text into. All you would need to do is write text in the text box provided and press the hear it button at the bottom of the window. The app displays ads on it. But they are not very disturbing. In case you want to get rid of the ads you can upgrade to the paid version. The save it option at the bottom of the window is for saving a piece of text which you need to learn. You can just give the file a name and save it. This way you don’t have to type the same thing again to hear its pronunciation. You can just go to saved items option at the top of the window, from there select the text that you saved and press hear it button. The saved items window also has an option of save as MP3, where you can save your text note in a MP3 file format on your PC. But this is only available with the paid version of the app. The settings option lets you tweak few settings like change the gender of the text to speech voice, set the speed of reading, set the accent, select the language you want. The screenshot of the settings option can be seen above. You can also change the theme of the app from settings, the icon for it is given at the right side bottom of the window. Settings also gives playback options, where you can select how you want your text played if the window closes all of a sudden. You can choose between playback from the beginning of the text or playback from the point it was closed at. You will also see a app sync option, in which you would need to be logged in using the same email address on other devices you want to sync this app with. The default text to speech language of the app is English. But what if you want to change it to say German or French. When you go to the language selection drop box and select a different language, you will get a pop up message, as shown in the below screenshot. For changing the language you are required to have the necessary language installed. 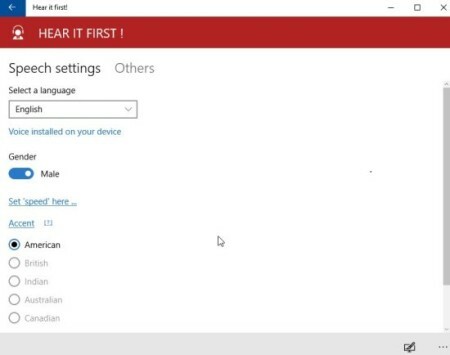 For this you have to go to your Windows 10 settings and look for time & language option there. From there select region & language, then click on add a language option. Select the one you need from the list of languages given. Now click on the language that you selected and three buttons will appear under it. From the three buttons click on the Options button. Now in this window look for the speech heading. Under the speech heading would be a download button and the size of the download would be mentioned as well. Click the download button to download this language. You would be required to restart your computer and then you can easily use the language in your app. Save text to play them later. Pin saved text to start menu. Sync saved text across devices. Overall, I found the app to be pretty nice. The app can help you with learning the correct pronunciation of words. Do check it out. 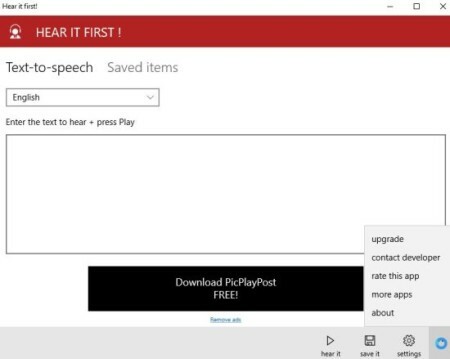 Check out Hear it first for Windows 10 here.